So the time has come to “retire” the 996 from daily use! It’s being SORN from end of this month for 6months to see out the worse of the weather over the winter tucked up in the garage...after all the work I’ve done to it this year particularly on the mechanicals I want it to feel like this for as long as possible! Also will feel more special only using it in nice weather! Over the winter I plan on swapping to M030 now all the coffin arms, tuning forks etc have been done and maybe some new rubber (probably going to opt for some road legal track tyres purely as it’s not a daily driver and it’s not going to be purposely driven in the wet) - should make a massive difference. To facilitate this, I’ve had to purchase the wife a new runabout so I can use the A4 dieselbore for my daily. So after a few months of searching I’ve finally found a very tidy R53 Cooper S! It’s actually pretty good fun and bangs and pops and makes a nice supercharger noise! Anyone else tucking theirs away soon / buying winter hacks?! I've had an R53 Cooper S since new - haven't felt the need to change it, it's so good at doing so many things. Not slow either and easy to tune - mine's running 235bhp with a supercharger reduction pulley and some other stuff. They're great fun on the road! Hopefully you can get it all done and in time for the spring (don't wait 6 months!) .. I planned on the 17% pulley kit plus intercooler and JCW exhaust and airbox and that’s about it. Make sure you do get her out again - I Sorned mine in March due to building work on the house (which overrun) and ended up not getting her out (apart from a couple of gentle trundles around to keep everything moving) this summer! Tyres are such a subjective decision! One person will rate them, another not so much! Possibly going either Cup 2 or AD08R..many months of deciding first! Looks like I'll be needing some bodywork done and so I will probably SORN mine once that's done. Few reasons, Im approaching my mileage limit with 6months to go, I have other priorities coming up over next 4-5months and Id like to freshen up the underside as well. Id prefer to run it but with the winters we get cars do get a fair amount of abuse from roads/salt. Mine's going in its outside Carcoon from the beginning of November. Out again in March in time for its MOT, hopefully after all the winter weather has finished. Well impressed with it over last winter. SORN’d mine at the end of September. It’s nice to give it a deep clean and wax etc then tuck it away turn key ready for spring. In the meantime it’s quite therapeutic not to be fussing over the car all the time and be able to enjoy other hobbies on a nice day without dilemma. The more I see a Turbo, the greater the itch to get one. @HSC911 flip flops and socks for the house all the way! I've got a 17% reduction pulley, colder plugs, Works GP intercooler, Dave F airbox (not sure how easy it is to get hold of these any more), couple of other small tweaks but not major ones. 1320Mini is the place to go if you don't want to have to do it all yourself! Agreed! No damage to any painted bodywork, I’m quite steady with a grinder for cleaning! Another on your choice, i have just got into a R56 John Cooper Works, had R53 years back and loved that too, i wanted something small and nippy and not bore myself to tears daily! 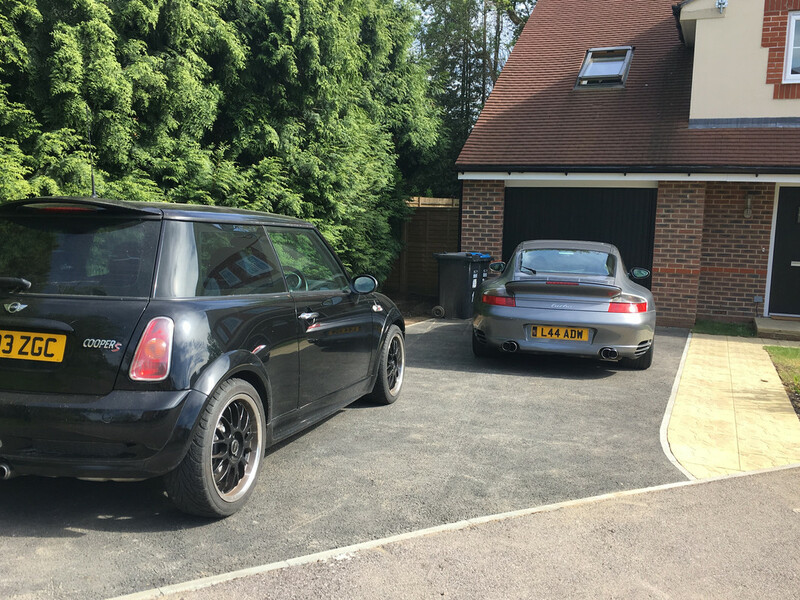 Not quite up to your choice but I have an R56 Cooper with a JCW body kit. For 120 horses its still a lot of fun to chuck about. Unfortunately not too much you can do to turn the wick up. Some chips will give you a few extra bhp and a Milltek exhaust will do the same. Ive been scanning AT and PH for a sorted R56 Cooper S but no rush so can afford to be picky. 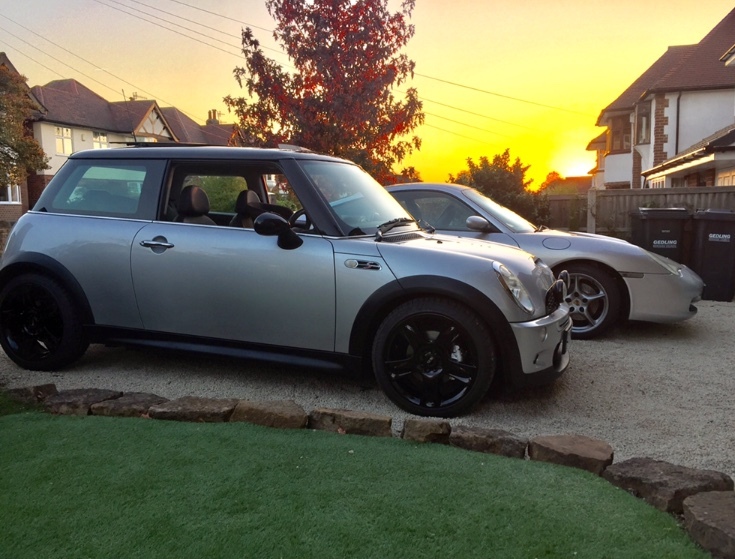 I'm another one with a BMW Mini, just a 2001 Cooper though... with crazy cvt gearbox! I'll be using that a bit more and the 996 a bit less over the winter.